Bring on the romance and the rejection. Buffy's love life is finally entering the story fold on Buffy the Vampire Slayer Season 1 Episode 5! When we're talking about common themes in Buffy the Vampire Slayer, we can't forget romance. Before we even tackle anything about date night, what was with the vampire in the opening scene? I mentioned this in the rewatch for Buffy the Vampire Slayer Season 1 Episode 1, but I'm happy the vampire makeup improved. The design here was terrible! His face was contorted, the features were too strong, and the large teeth...I can't even. The fact he was a quick kill vampire shouldn't be the reason to skimp out on design. I get why Buffy and Cordelia were attracted to him. He had that shy, mysterious, "didn't-know-he's-cool-which-makes-him-cooler" vibe. And he doesn't try too hard. I understand why Buffy likes him; they're both outsiders in a way. However, my theory for Cordelia being obsessed is wanting what she can't have. Owen barely gives Cordelia the time of day. Cordelia is Ms. Popularity and queen bee. She wants to win. She doesn't truly like him. Buffy: Do you have any more copies on Emily Dickinson?! I need one. 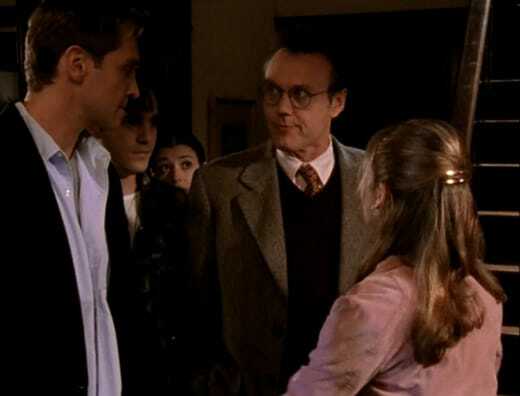 Giles: Buffy, while the fact that you want to check out a book would be grounds for a national holiday, I think would we should focus on the problem at hand. Buffy: Does this outfit make me look fat? Permalink: Do you have any more copies on Emily Dickinson?! Do you think Cordelia was fuming after Owen invited Buffy out the first night? I don't think that ever happened to her before where a guy was more focused on someone else. She usually has guys wrapped around her finger. It's such a contrast to Jesse from Buffy the Vampire Slayer Season 1 Episode 1. Buffy the Vampire Slayer Season 1 Episode 5 is the first time where it isn't easy for her. I loved that Giles couldn't care less about dating or teenage concerns. It means nothing to him. He's more focused on the REAL problems. In the grand scheme of living on a hellmouth, date night with Owen is probably at the bottom of the list. And he's right to some extent. But...guys! Love life! Normalcy! Giles: But I assume I don’t have to warn you about the hazards of becoming personally involved with someone who’s unaware of your unique condition? Buffy: Yeah, yeah. I read the back of the box. 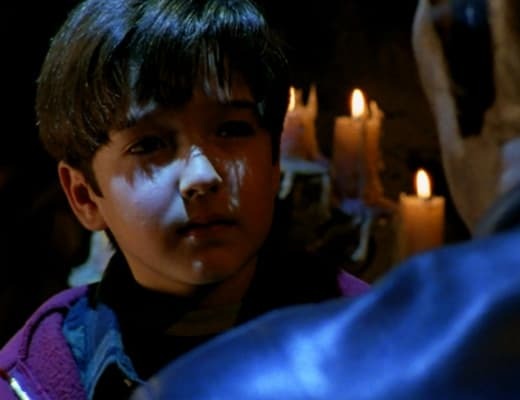 Giles: If your identity as a Slayer is revealed, it could put you and all those around you in grave danger. Buffy is at her height sass after the nothingness in the cemetery. Giles brought it on for making her miss her date. She's showing why her secret Slayer power is quips. Was anyone else else upset seeing Cordelia dancing with Owen at The Bronze? It's sad to see Buffy heartbroken. But what was with Cordelia being all...handsy? It's like she was trying to mold Owen's body like clay. It was awkward to watch. Let's take a second to talk about the music. The background track during the dance scene between Cordelia and Owen was perfection. Sometimes there are songs thrown in to set the mood that don't make sense. That didn't happen here. Buffy's heartbreak combined with the track made the moment. As terrible as it sound, this may be my favorite scene of "Never Kill a Boy on the First Date". Particularly because of the combination of shots, song and moment. Xander: So you just went home? Owen asking Buffy out on a real first date seemed like a given. He didn't actually do it the first time. And her not showing up probably worked a lot in her favor to push him to do so. He's so awkward and shy. Owen needs to break out of his shell. Him making the first move is a good start. Everything involved with the first night and the bus attack was obviously a red-herring. It wouldn't be too easy for Buffy and Giles to stop it. I don't blame Buffy for not believing Giles after he comes back with the news of the five deaths. Nothing happened the first time and there were no leads for the second. It's too circumstantial. She was fine to go off on her date. But Giles should not have gone exploring on his own. Buffy: This is the ‘90s. The 1990s in point and fact, and I can do both! Clark Kent has a job. I just want to go on a date. Giles: Well, I suppose it was a fairly slim lead. Buffy: Thank you, thank you, thank you! And look, I won’t go far, okay. If the apocalypse comes, beep me. Permalink: If the apocalypse comes, beep me. I'm on the fence about Buffy's first real date with Owen. Anything that could go wrong did go wrong. Angel popped up, Cordelia made her move, and Owen pulled himself into a vampire slaying at the funeral home. It's definitely a date to remember. On the bright side they did hit it off. Buffy was having a good date at The Bronze. You know, before it went bad. Cordelia: Owen! Look at you here, all alone. Owen: Cordelia, I’m here with Buffy. Cordelia: Oh, okay. You want to dance? Owen: No...I’m still here with Buffy. Cordelia: You are so good to help the needy. Buffy: Cordelia, Owen and I would like to be alone right now. And for that to happen, you would have to go somewhere that’s away. Cordelia: Well, when you’re ready for the big leagues, let me know. Permalink: Well, when you’re ready for the big leagues, let me know. Why were only two people from the shuttle attack turned into vampires? I never understood this before, and the rewatch brought it up again. We had The Anointed One (more on that below) and the religious creep. And yet everyone else just died? This never sat right with me. Wouldn't The Master want to increase his odds by turning everyone in the attack? He couldn't have known the child was the one. Giles's, and The Master's, prophecy outlined everything, which is one of the reasons why Giles was worried to stop vampires from rising. This was a confusing plothole. Would Owen have died in Buffy's world? I'm not so sure. Don't get me wrong, he was hooked on the thrill of it as this was new to him. However, he seemed like an easygoing person. If Buffy cautioned him, he would've calmed down. Buffy's reasoning for using Willow and Xander as examples didn't make sense. They were innocent humans at first who needed to be brought into the fold after seeing vampires. And they did make mistakes even when knowing the truth. Though, Owen being more interested in the danger than Buffy herself was reason enough to end things. She is more special than any adventure. Boy, bye! I've never been a big fan of The Anointed One. What was his purpose? What did he do? Nothing, that's what. Sure, he had an important moment with a prophecy later on in Buffy the Vampire Slayer Season 1. However, for the most part, it was pointless. This was a squandered enemy. I think this could be due to the fact it was a child playing a vampire character. There's not much longevity with a supernatural villain once the actor starts aging. There's only so much you can fake with makeup. What did you think of "Never Kill a Boy on the First Date"? 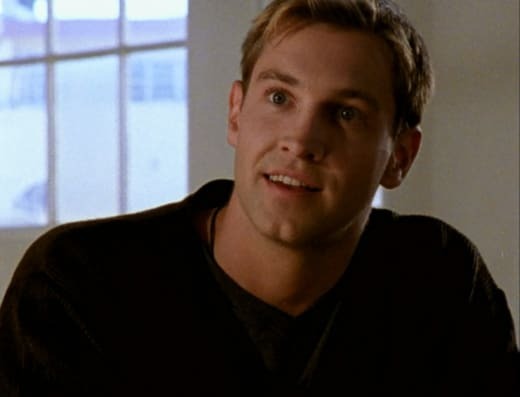 Should Buffy have given Owen another chance? Did you want The Anointed One to be a child vampire? Want to join us in rewatching Buffy the Vampire Slayer? We'll be posting new posts every Tuesday and Thursday. Come back here and share your thoughts. And there will be a time of crisis, of worlds hanging in the balance, and in this time shall come...”The Anointed.” The Master’s great warrior. And the Slayer will not know him, will not stop him, and he will lead her into hell. As it is written, so shall it be.